LinkedIn publishing provides B2B marketers with a highly targeted combination of content publishing platform and social network. Likeable Local’s CEO Dave Kerpen saw the value of LinkedIn publishing when it was only available to select influencers. 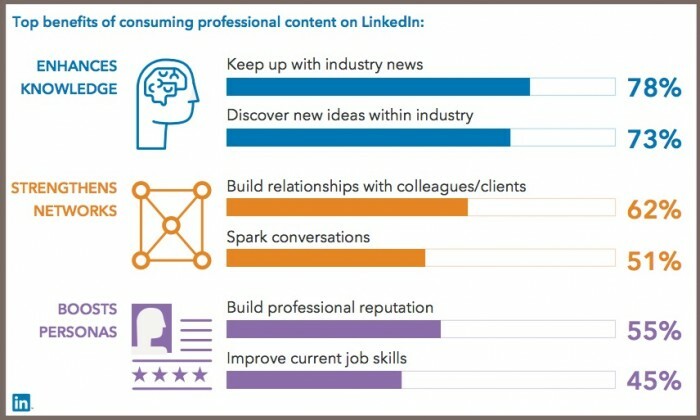 LinkedIn reaches 1 out of 3 professionals by providing them with relevant content. 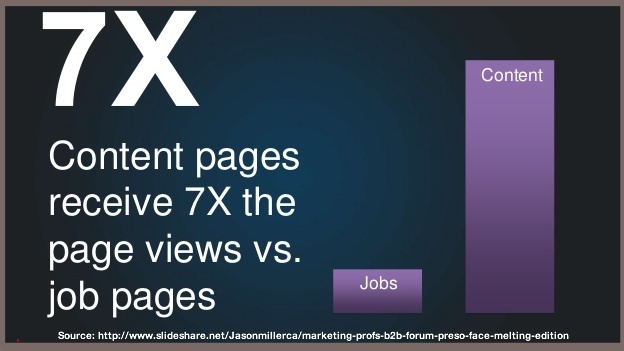 LinkedIn content pages attract 7 times more views than the job pages because people only check job pages when they’re seeking a new job. On average, people who consume professional content spend 8 hours per week on industry news and trends according to LinkedIn research. 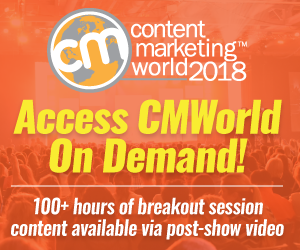 65% of these individuals increased the time they spend with professional content during the past year. Opened to its entire membership in early 2014 LinkedIn Publishing provides a powerful addition to your content and social media marketing strategy to reach your core B2B audience. 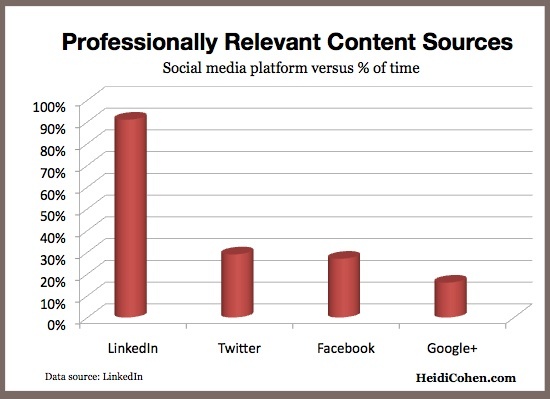 LinkedIn trumps Twitter, Facebook and Google+ for professional content. Enhance their knowledge by keeping up with industry news. Become an influencer in their field. 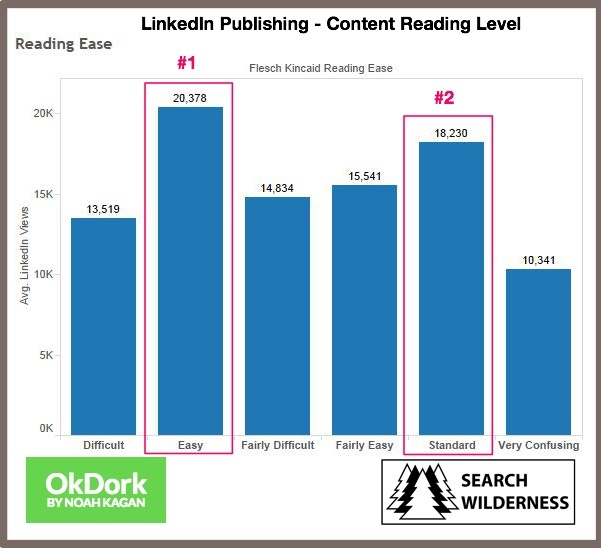 To understand how to achieve publishing success on this platform, examine 2013’s top LinkedIn posts based on content from 1.6 million publishers. Many articles focus on leadership and talent – “how to succeed in business” is a recurrent theme. Before posting on LinkedIn, take time to appreciate how to craft long format content on LinkedIn and monitor what your niche’s key influencers (as well as the top LinkedIn influencers) are posting. To appeal to the largest possible audience, brainstorm how to associate your topic with business success. 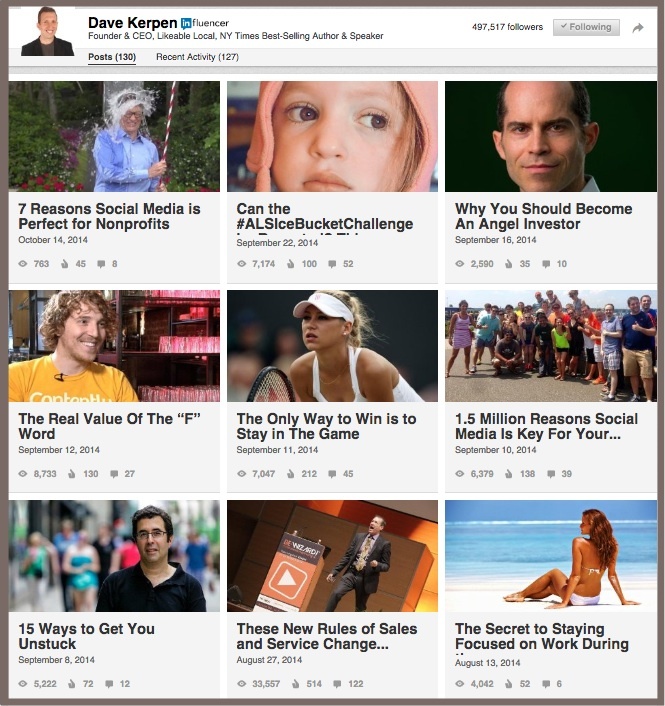 Here’s a snapshot of Dave Kerpen’s recent LinkedIn publishing. 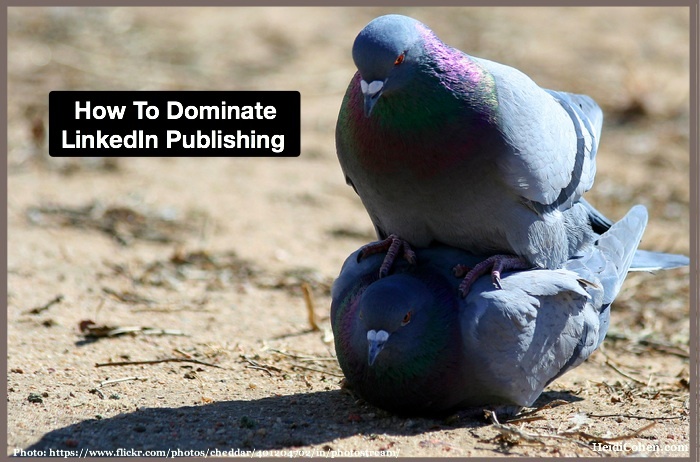 Follow these 10 content marketing tips to dominate LinkedIn publishing. 1. Develop a tailored LinkedIn content strategy. Integrate it into your content marketing and social media plans. To achieve measurable business results, determine your goals based on your business objectives. Your LinkedIn content should supplement and complement your other owned media including your blog. 2. Focus on your key audience. On LinkedIn include both your connections as well as your target market. Part of the strength of LinkedIn publishing is its ability to reach beyond your own circle of colleagues. Consider these factors when developing your marketing persona. 3. Use your words to create long form content for LinkedIn. Ideally write 1,900 to 2,000 words to attract the most views, comments and shares. 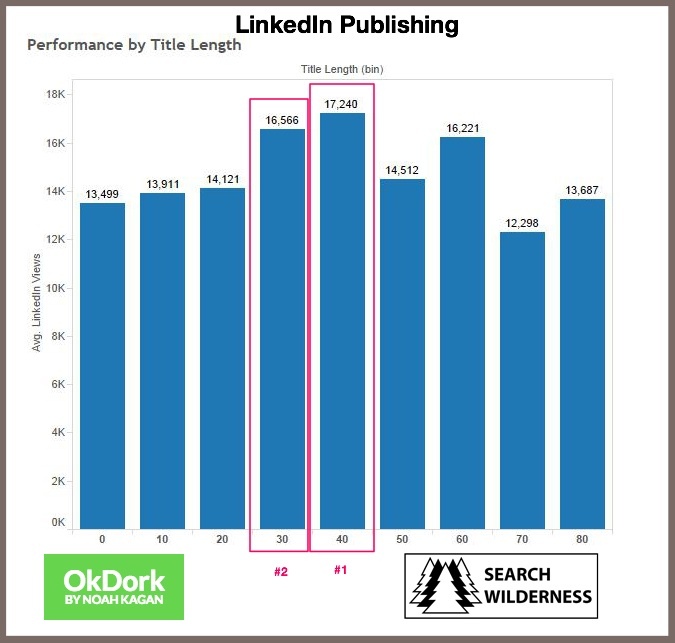 While longer LinkedIn content is better, the curve doesn’t increase at a steady pace. Specifically, performance falls off significantly for posts between 1,600 and 1,700 words and for 1,200 and 1,500 words. Publish your LinkedIn posts on a regular schedule to build a consistent readership. Integrate your LinkedIn content into your editorial calendar. Where possible, take advantage of the top 10 topics on LinkedIn. They include leadership, innovation, technology, entrepreneurship, marketing, professional women, social media, economy, advice and education. 4. Write for middle school students. Don’t assume that your LinkedIn audience is necessarily more educated. The next largest audience is a “standard” difficulty. Easily read by 13 to 15 year olds, this content is understood by 80% of adults. 5. 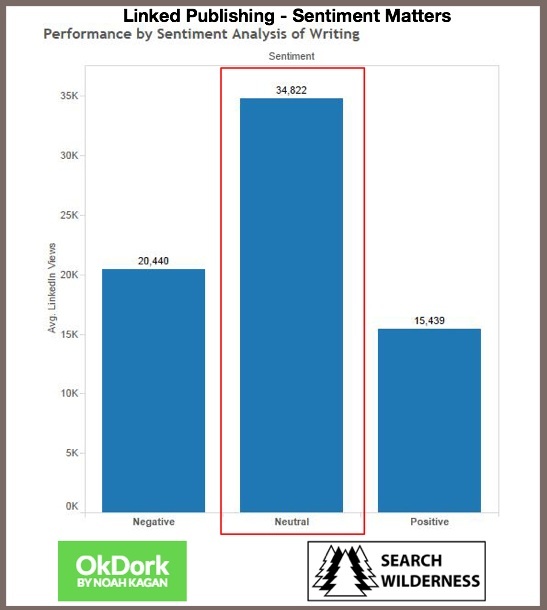 Keep your LinkedIn content sentiment neutral, not too positive and not too negative. Stick to the facts for greater reach. Positive LinkedIn content generates more shares and likes. 6. Craft very short titles on LinkedIn. A tweet is long compared to the optimal LinkedIn title. Based on Shapiro’s findings, use 40-49 character titles to receive the greatest number of post views. How you present information matters on LinkedIn. Skip the headline questions; they depress results. Use “How-to” and List headlines. These results are directionally similar to Conductor’s headline research. 7. Rock LinkedIn posts with images. 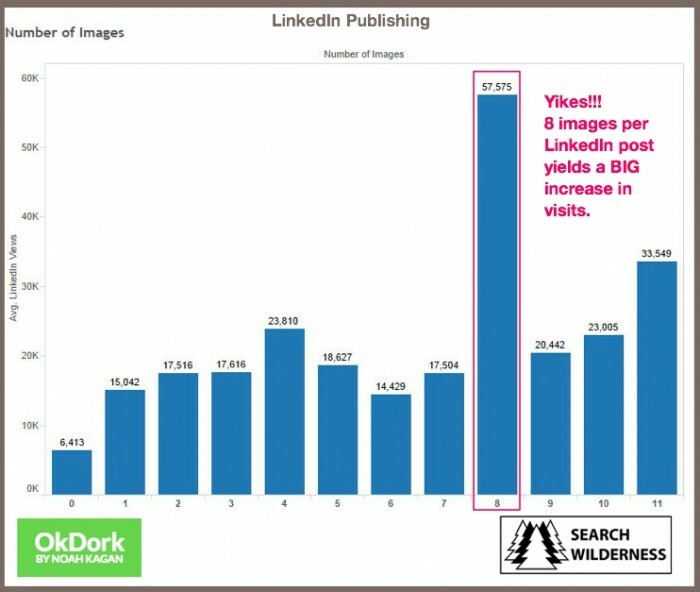 Put 8 images into your LinkedIn post to generate the most shares, likes, comments and views. Using 8 images is over 70% better than the next highest number of images, namely 11. Further, it’s more than double any other number of images. 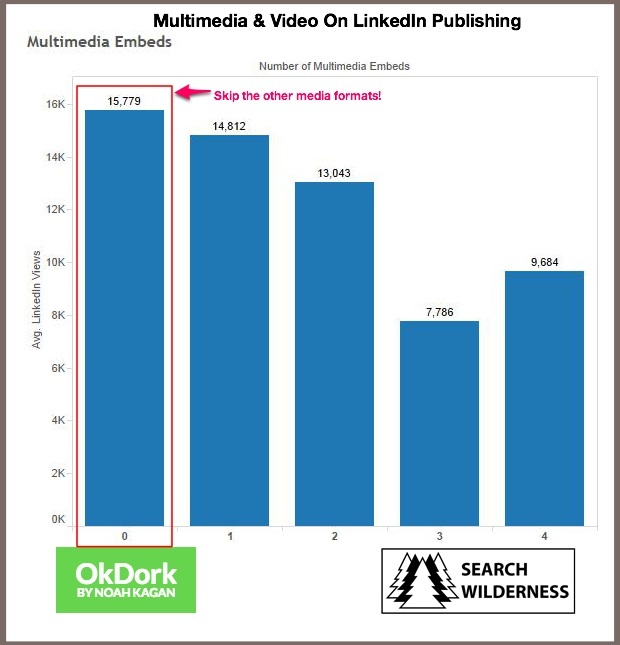 While LinkedIn allows you to include YouTube, SlideShare, TED, Getty, Vimeo and/or Lifestream in your posts, these media formats don’t add incremental value in terms of pageviews or shares. To the contrary, they reduce visits and other metrics. Where appropriate include proper attribution. Remember, you’re responsible for any legal or reprint issues in your LinkedIn content. 8. Add outlining and bolding to aid content consumption. 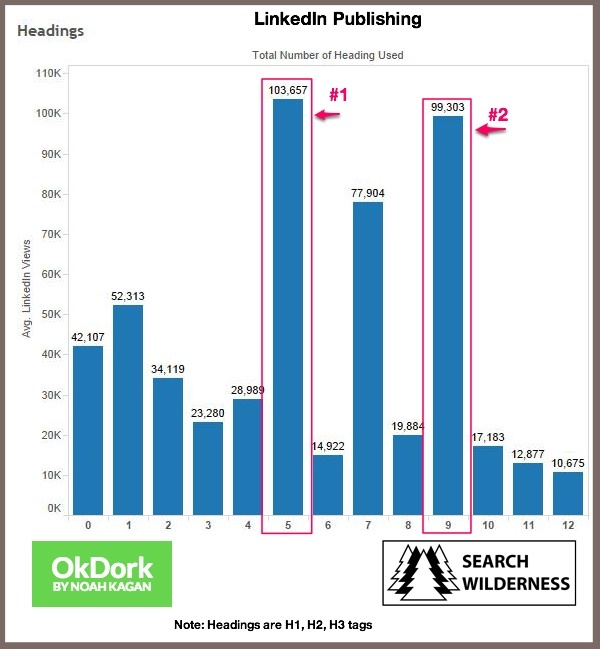 Use of headings (such as H1, H2, H3 tags) to break your LinkedIn post into chunks helps post performance. Shapiro discovered that either 5 or 9 headings maximize views. 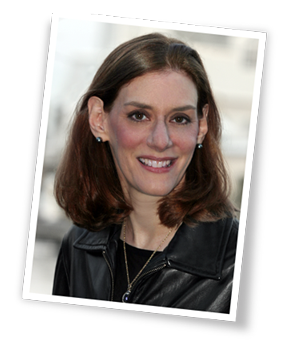 Before you hit publish on LinkedIn, edit your work. While this seems obvious from a content perspective, it may not be from a social media perspective. 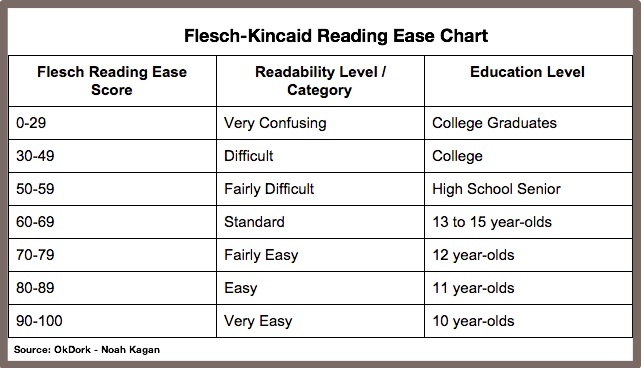 Despite what you may think, readers appreciate and expect good grammar. Also, bad grammar reflects poorly on your brand. 9. Promote LinkedIn content across other social media platforms. 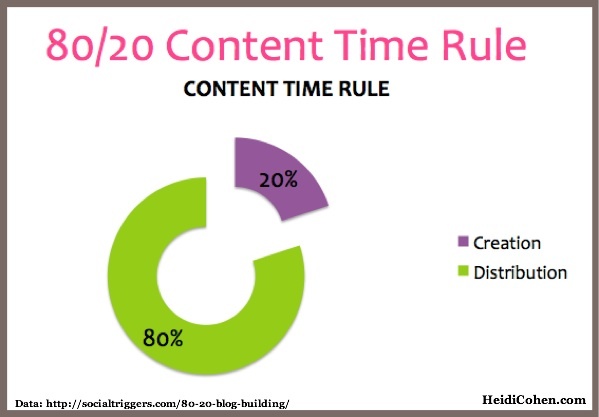 As Derek Halpern recommends, spend 80% of your content time promoting your work. Use call-to-action to improve results. A call-to-action reminds your target audience to take the next step in your process. It makes your content more measurable. Publish on Thursday to maximize pageviews. Also consider when your target audience has time to consume your long form content. 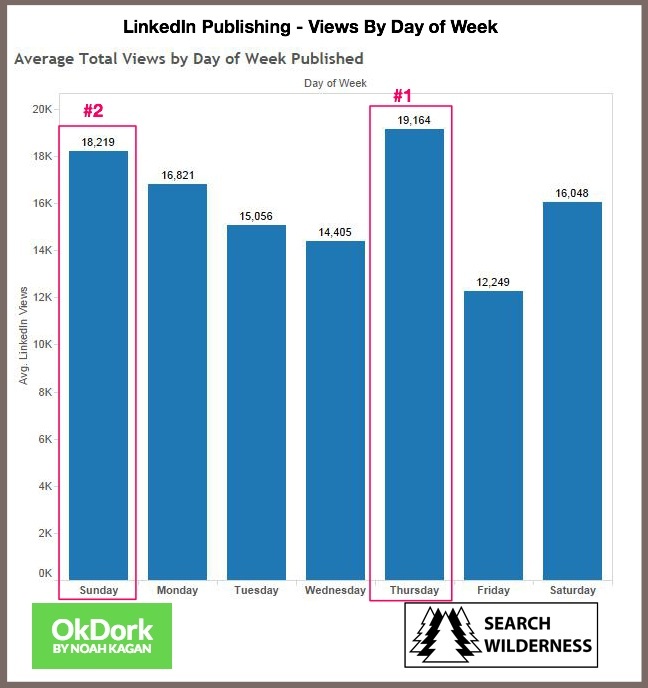 Sunday is the second best day for pageviews on LinkedIn. 10. Track the results of your LinkedIn content. Specifically measure how your LinkedIn content has performed in terms of driving your key indicators. In addition to monitoring pageviews and shares, check that your LinkedIn posts contribute to your business goals. LinkedIn publishing hits the B2B marketing sweet spot for professional content marketing and social media. 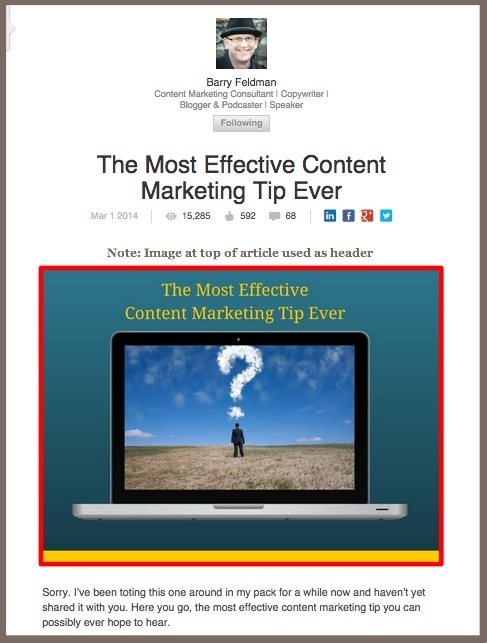 Integrate regular LinkedIn post publication into your editorial calendar. As with other media channels, consistent publication of tailored content is necessary to build a loyal readership. In many ways LinkedIn’s platform is similar to other media platforms. BUT to optimize your results and dominate this network, understand the differences. Jump onto LinkedIn publishing now while it’s still an emerging platform and there’s opportunity. I plan to do so in the coming weeks. If you have been using LinkedIn publishing, what has your experience with the platform been? What do you recommend that others do to maximize their results? Tags B2B, Barry Feldman, Chart, Dave Kerpen, Derek Halpern, LinkedIn, LinkedIn Publishing, Marcus Sheridan, Paul Shapiro. Bookmark the permalink. great job at such Concepts… can’t tell you how much I, for one appreciate all you do! this order, I could not have done. Had a lot of work. pleased, and I got the additional dividends for mediation work. While I have had success with LinkedIn publishing, it is unreal for me to add 8 images. I have seen articles with hundreds of thousands of views with less than 600 words. I think the key is a massively attractive title with a compelling promise. I agree that a great title can drive massive traffic. It’s the key to BuzzFeed and Upworthy success. 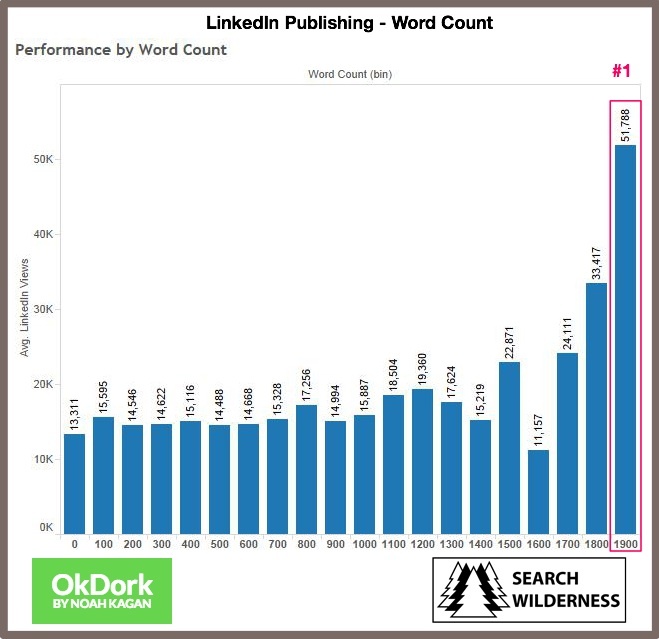 I’m surprised that content with less than 600 words performs well since a number of different data sources state that you need over 1,000 words. With regard to images think more broadly than just a photo. For example research charts and screenshots which are key to articles on industry trends and it makes sense to have at least 8 images. Further, spacing images out encourages people to keep scrolling in a longer article. Thanks for replying so quickly. Look at how short Seth Godin’s blog posts are. While he is an anomaly, it nonetheless serves as an example that great content does not have to follow the rules. I agree that Seth Godin’s blog posts are short. Often very short. Unlike many other social media and content marketing voices, Godin has authored 15+ best selling books, quintessential long form content! This combination of factors means Godin can make his own rules with regard to content and communications. My recommendation to most marketers is to craft quality content that meets the platform’s minimum practices.